When we get to hang out with one of our favorite geeky authors at our favorite local bookstore, it is a good day. We had the chance to meet up local Portland author Ian Doescher at Powell’s City of Books. Ian is known for writing the New York Times best-selling William Shakespeare’s Star Wars and the sequel, The Empire Striketh Back. 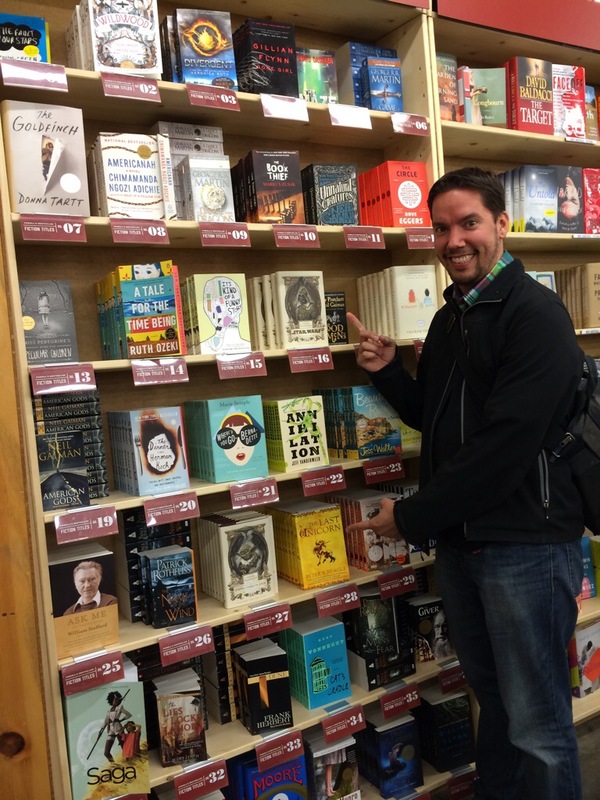 Ian Doescher manages to get on the Powell’s Books bestseller shelf twice, at #16 and #27. I’m sure once the third book comes out, it will be on there too! Now, with The Jedi Doth Return slated to come out on July 1st, 2014, the trilogy is wrapping up— so we chatted a bit about his plans and thoughts on the series. In the very immediate future, Ian is prepping to go on tour in July to celebrate the publication of The Jedi Doth Return. He’ll be back at Powell’s and may be at a bookstore near you. He plans to continue writing, but will probably put the Star Wars/Shakespeare mash-up aside. However, he says the writing is still fun, so who knows. After all, he remains “cautiously optimistic” (joining millions of other fans) about the upcoming Star Wars Episode VII, scheduled for release in 2015. He’s even thrown around the idea of other Shakespeare mash-ups, At this point, its still fun. However, Ian believes that “At some point, the schtick gets old.” He’s working on other projects currently and although the trilogy is over, he’ll continue writing. Ian signs a copy of William Shakespeare’s The Jedi Doth Return for the first time. Whenever we see authors, one of the coolest things is getting books signed. We got all three books signed by Ian, including a copy of The Jedi Doth Return we received in advance for a review. We were tickled to hear it was the very first one he’s signed. I’m sure he’ll get more practice on his July tour! Fans all over have embraced the Star Wars Shakespeare trilogy, with one fan even going so far as to order a reproduction of Darth Vader’s helmet as depicted on the cover of Shakespeare’s Star Wars. Ian Doescher loved it so much, he ordered one as well. Who wants to see that picture! After some googling, I found a Darth Shakespeare helmet creation by Ryan of Mad Art Lab, the making of he details in his design diary: The Saga of Darth Shakespeare. I wrote in iambic pentameter once, and only once, finding it extremely difficult. So I had to ask, was it difficult, turning whole movies of dialogue and action into iambic pentameter? There are rabid fans in both camps, Shakespearean and Star Wars and adapting such famous and beloved works could be a little nerve-wracking. However, Ian Doescher says the fans on both sides have been “amazing.” Both Star Wars and Shakespeare people have given huge amount of support, the fans are awesome. Despite that, there will always be critics. One person online was apparently incensed about a scene on Hoth. Why did the Wampa have lines? There are some lines so famous, that even while turning them into an elizabethan play, Doescher couldn’t change them. Hans still famously answers Leia’s declaration of love with the same two words. “I couldn’t touch ‘I know,'” he says. And the rights to the Star Wars still belong to Lucasfilm, so how do you please both the fans and also get the manuscript approved? What do you do when Hans meets Greedo? In the end, there are many nods to fandoms and even many Easter Eggs hidden in the pages. We will be featuring a guest post written by Ian Doescher next week that showcases many of these references and secrets. Fans may come from both worlds, but is Ian Doescher more of a Shakespeare fan or a Star Wars fan? “I’m pretty much squarely in between,” he says. However, the two have been a part of his life for a long time; years ago, he wrote his dream girl “will like baseball, Star Wars and Shakespeare” and says now that two out of three isn’t bad. It was great hanging out with Ian at Powell’s City of Books, Portland’s famous independent bookstore. In the end, it was wonderful chatting with him— Taylor and I thoroughly enjoyed our conversation and hope to see him again. But in the meantime, I have Star Wars on my mind; a review of The Jedi Doth Return is coming soon, I’m running the Jedi Challenge, and there will be more Ian Doescher next week. The Jedi Doth Return blog tour starts on Monday at Good Books and Good Wine, with his guest post on the hidden secrets of the books featured on GeekyLibrary on Thursday, June 26th. So stay tuned! To read or not to read, there is no try. Skywalker, Skywalker Wherefore art thou, Skywalker? Though this be madness, yet the Force is strong in ‘t. It was pretty awesome— The third book is coming out very soon, so now is a good time to read them!